Pug at Play: What are the Best Toys for Pugs? 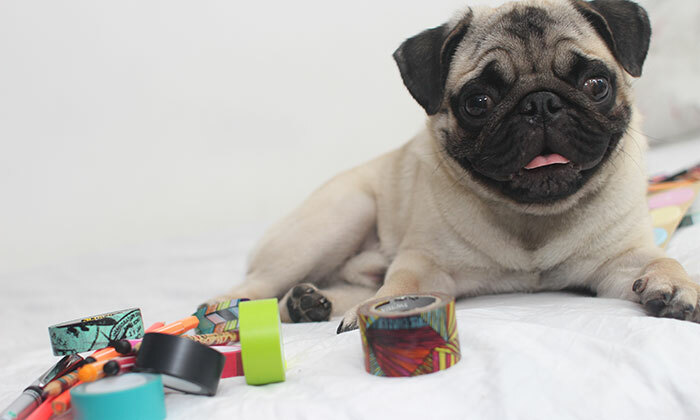 » Pug at Play: What are the Best Toys for Pugs? When he is not resting in his favorite place - your couch - Pugs like to play. Chewing is a normal behavior for Pugs and Pug puppies and play biting is one of their favorite. So what are some of the best toys to keep this playful sometimes clownish breed stimulated and protect your couch from being chewed on? **Clicking the links above will take you to Amazon, where you can see the latest prices, customer reviews, product specification and more. Pugs are a popular dog breed known for their energetic, playful, affectionate, and friendly nature. This breed is good with children but can be rambunctious and a little bit stubborn. Pugs need regular physical activity to manage their energy levels, but require less exercise than some other breeds. 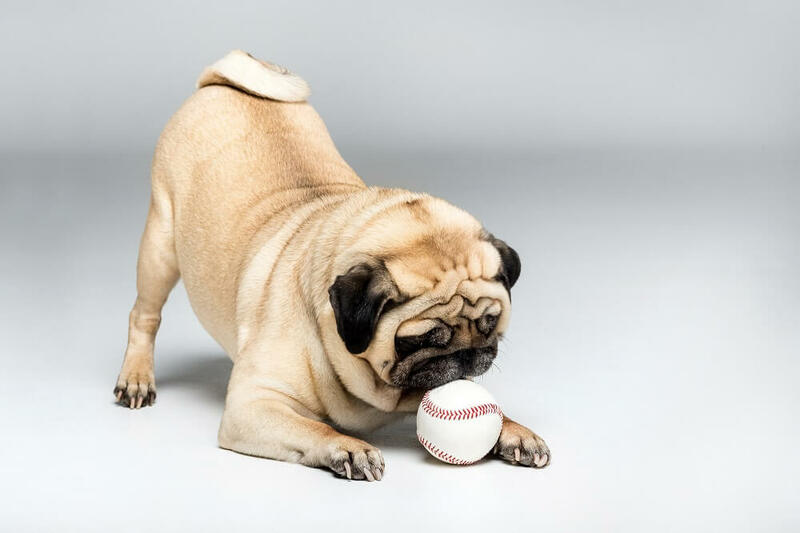 Pugs have a lot of interests and passions (like sniffing and digging), so owners can choose from several options when it comes to keeping this breed busy. Anyone who is familiar with ﻿﻿﻿Pug﻿﻿s knows that they are a distinctive looking toy breed with pushed in, wrinkled faces and curly tails. Pugs have dark prominent eyes, an underbite, and ears that fold forward. 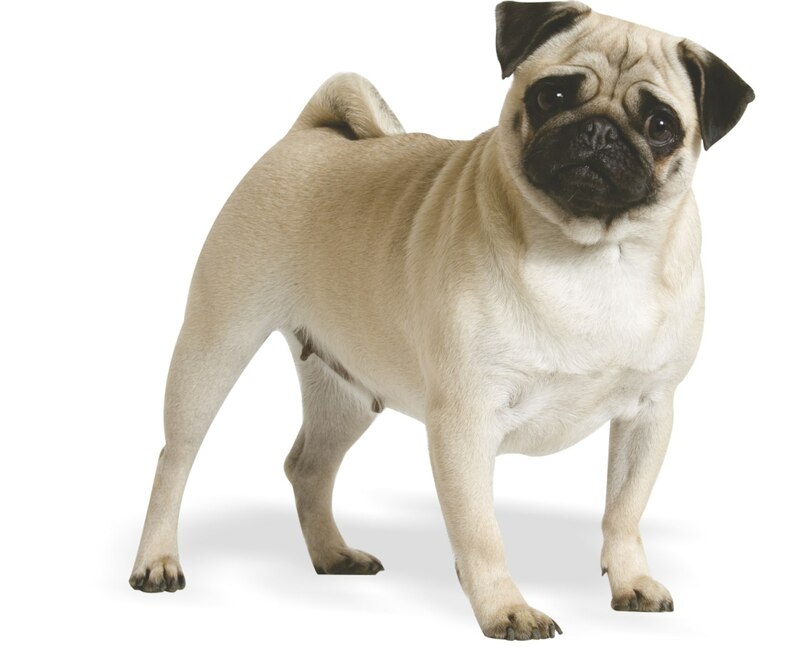 Their build is compact but muscular, like those of the larger dogs that make up the modern Pug’s ancestors. Pugs typically have short, glossy coats that are brown, silver, or black in colour, with black masks on their faces. Pugs are believed to have originated in ﻿China over 1,000 years ago, and they have been taking the world by storm since the 16th century! Everywhere that this breed goes, people fall in love with them. Owners can avoid the stubborn streaks that pugs are known for by using rewards based training with small treats and toys, keeping training in short lessons to avoid frustration. How does your Pug like to Play? Pugs are playful dogs that will be happy to take part in just about any activity, but owners should be careful to make sure that their pugs don’t overheat. This means that playtime should take place inside on warmer days. Since Pugs eyes are quite prominent, it is also important for owners to remember that they are prone to eye damage. A well-trained Pug has the intelligence and energy needed to take part in dog sports like agility, rally, and competitive obedience. Since they are a toy breed, they can do well in small spaces if their owners give them daily exercise and attention. Early and consistent training will help make sure that Pugs don’t pick up bad habits like nipping or jumping. By turning obedience into a fun past-time, owners will have playful and happy Pugs as part of the family. Pugs have a strong sense of smell and love to follow different scents around. Owners who notice that their pug loves to work with its nose should visit their local kennel club to see if there are any tracking trials around. Tracking trials are scent trails made for dogs to follow, like search and rescue training﻿﻿. Owners can also do this at home by telling their Pug to wait as they leave a scent trail with a treat for their dog to find at the end. Other favourite Pug past-times are digging and chasing other small animals. To keep their Pug’s desire to dig at bay, it is a great idea for owners to create a designated digging box where their pet can dig to their heart’s content. Owners can use this box to hide toys in different places for their Pug to find, giving them mental along with physical exercise. When all else fails, Pugs are always happy with a simple walk outside. Taking dogs to different places to see new sights and smell new things is a great way to keep them happy and active. Owners can take their pugs out for several short walks a day or one long one, keeping in mind that they shouldn’t walk their Pug for too long during warm or humid parts of the day. 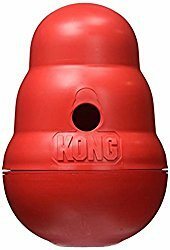 The KONG Wobbler Treat Dispensing Dog Toy is non-stop amusement for your Pug. Standing upright this toy wobbles when touched and occasionally revealing appetizing treats which may be concealed inside. Even the most experienced dog will find this interactive toy challenging and rewarding with its unpredictable movement. This toy is a must buy also if you want to use it as an alternative to your Pug's bowl to help extend or even slow down their mealtimes. This interactive toy is a clear win-win as its fulfilling your dog's mental and body exercise but also keeping them entertained. Most dogs, including Pugs, have the desire to chew things. Preferably, owners want those things to be toys and not shoes or other household items. Purchasing chew toys like ﻿Nylabone De﻿ntal Chews﻿ can be a great way to keep Pugs occupied. 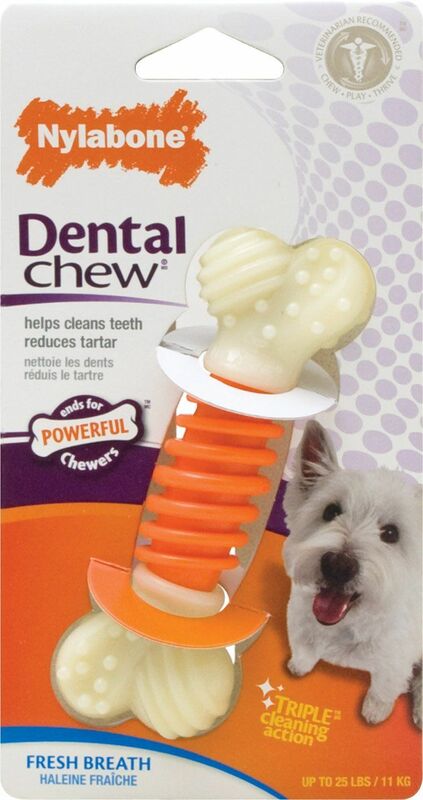 It gives them a chewing outlet and keeps their teeth healthy at the same time! Since Nylabone is made with durable materials, owners don’t have to worry about their dogs choking or swallowing small pieces. Pugs are lively little creatures who love to be at the center of attention. Playing a game of fetch with an interesting squeaky toy is a great way for owners to bond with their pugs. 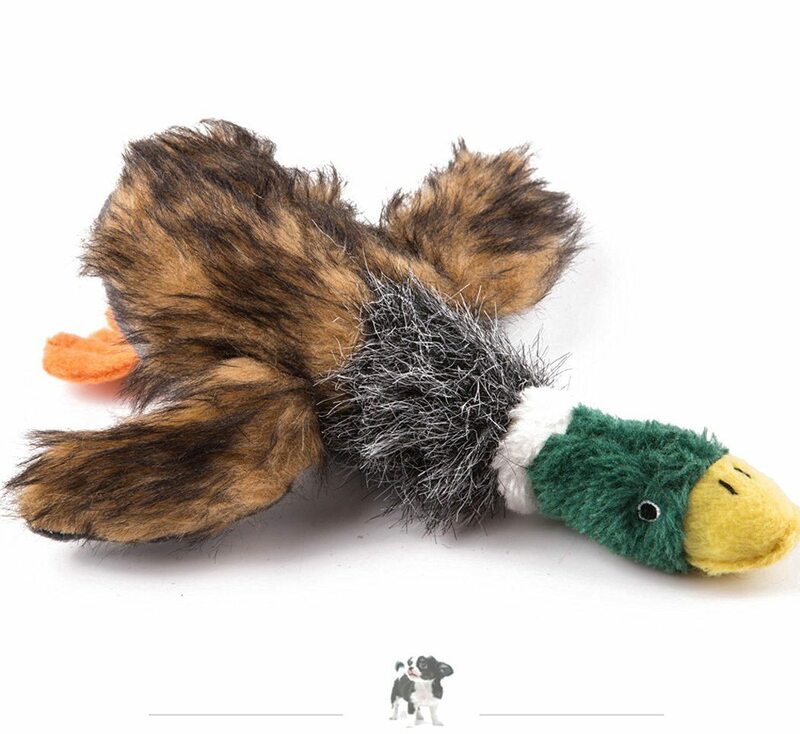 Toss and retrieve toys like ﻿Wangstar’s Pet Mallard Duck Dog Toy﻿ are great because they look like real animals that dogs enjoy chasing. You can also use as a tug toy - what dog doesn't like playing a good ole game of tug! Toys that are too big: It is always important for owners to look for toys that are appropriate to their dog’s size. Since Pugs are a toy dog breed, owners should look for toys that are specifically made for small breed dogs. These toys will be easier for Pugs to play with. Pugs are entertaining little dogs that love to be around their families. Playtime with a Pug is always fun, since they love to goof around and are known for being interested in a lot of different activities. When looking for Pug toys, owners should look for small breed options that will keep this energetic breed interested for a while.